Is British Casino Accusing Poker Star Phil Ivey of Being a Ten-Million-Dollar Baccarat Cheat??? Wow!!! Britain's oldest casino is investigating a £7.3 million win by the world’s top poker player – and is refusing to pay him a penny. Crockfords, the exclusive Mayfair gaming club, has informed the Gambling Commission that it is withholding Phil Ivey’s payout. A source with close knowledge of the dispute described the situation as unprecedented. Accompanied by a ‘beautiful Oriental woman’, Mr Ivey, a 35-year-old Californian, was playing Punto Banco, which is a skill-free variant of baccarat, when he struck a remarkable winning streak. The 184-year-old casino initially agreed to transfer the winnings to his bank account, but six weeks on it has returned only his £1 million stake. Instead it began an exhaustive inquiry. Staff, including the female croupier, were interviewed at length amid fears there may have been some form of collusion. This is thought to have been ruled out. While it is unclear what, if anything, Mr Ivey has been accused of, lawyers for both sides are said to be engaged in an increasingly tense stand-off. It is not thought that police have been alerted. Sources said Mr Ivey played for two nights over the August bank holiday for about seven hours in all. Suspicions over the win intensified when it was discovered that his companion’s membership of another Mayfair casino had previously been suspended. The reason for this has not been revealed. Genting investigators flew to London from Kuala Lumpur to speak to everyone who was working on the two nights in question and to examine hours of film from surveillance cameras. The cards used and the shoe they were dealt from were also scrutinised. ‘No imperfections, or marks, that would have given Ivey an advantage were found. In any case, Ivey at no time touched the cards,’ said a source. ‘The shoe was also thoroughly inspected; once again the investigators drew a blank. 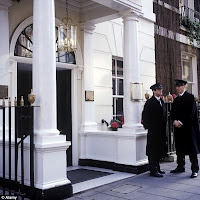 Doormen outside Crockfords Casino in Mayfair London Mr Ivey, who once picked up £10 million in a poker tournament in Las Vegas, was playing in a small private room on the ground floor of Crockfords. He sat next to his companion. The only other people in the room were the croupier and an inspector. All the action was recorded on ten cameras. Mr Ivey was initially gambling £50,000 per hand, which can be over in less than a minute. He was later given permission by the management to increase his stake to £150,000. Private club: Crockfords is Britian's oldest casino Punto Banco is the favoured game of high-rollers. The result is determined as soon as the cards are dealt – it offers marginally better odds than games such as roulette. At first, Mr Ivey’s losses were heading towards £500,000 but he recovered, and at the end of the first night was £2.3 million up. His winning form continued on the second night and by the time that he signalled he was ready to quit he had amassed £7.3 million. He told the management he wanted the money transferred into his bank account. The casino allegedly told him it couldn’t be done straight away because of the bank holiday, but assured him that it would be done on Tuesday, August 28. Mr Ivey left the club and the casino began an immediate investigation. Because of the difficulties involved, instances of Punto Banco cheating are rare. Twelve years ago a Triad gang used covert surveillance footage to read cards being dealt and relay a signal to a receiver outside the casino. The information was then transmitted to the player using a hidden earpiece. There is no suggestion that Mr Ivey is accused of using any of these methods. Although he is a respected figure in the poker world, casinos regard him as a ‘hit and run’ gambler, with a tendency to ‘quit after just a few hands if he wins big’. On this occasion, Mr Ivey, a divorcé, assured Crockfords bosses that he would play for a serious amount of time, and transferred £1 million into the casino’s bank. Mr Ivey declined to comment when approached by a Mail on Sunday reporter at a tournament in Cannes last week. ‘Please don’t talk to me. I am concentrating on my tournament,’ he said. The game Punto Banco is the sister game of Chemin de Fer Punto Banco is the sister game of Chemin de Fer, the high-stakes card game favoured by James Bond. The aim is to hold cards with a count of nine or closest to nine. You bet that either the hand held by the player (punto) or banker (banco) will win and place bets on the appropriate area on the table. You can also make a ‘tie’ bet. Tens and picture cards and multiples of ten count as zero: for example, 7 + 3 = 0; 10 + 4 = 4; king + 10 = 0. Its appeal rests on how the advantage can switch with each new card, lending huge excitement to the action. Like blackjack, the game is played with several packs of cards, which are shuffled by a croupier and dealt from a shoe. My Take: WOW!!! I am suspicious as hell. First off, why would Phil Ivey be risking a penny on baccarat when he has far the best of it in any poker event, be it a tournament or live action? Something had to be up. Okay, Ivey did not touch the cards bur that means absolutely nothing. There are so many ways baccarat shoes are fixed up and false shuffled with shuffling machines or without them. I suspect Ivey being part of a huge baccarat cheat scam involving Crockfords' employees but of course have no evidence. For me, it's the only thing that makes sense. But knowing Ivey, if he got involved in any cheating scam, he probably had way the best of it too, so you can expect to be hearing soon that Crockfords paid his winnings to him.